wutang wrote: TBF the wack job Christian evangelicals in America are the ones sowing the seeds more that anything. All in their desire to bring about the end of days where, ironically, they believe all Jews must convert to Christianity or face annihilation. Does that make Donald Trump the anti-christ? He’s not exactly very Christian. All that grabbing and grubbing. Gluttonous pos. And don't forget that Jesus disciples were armed. Teachers don’t want to be armed, unless they’re in which case they shouldn’t be teaching. Aren’t you a bit embarrassed to be supporting that gluttonous slob? Oh that’s ok then, as you were. The orange Jesus is under control of the MIC. He's just a warmonger who sells weapons. As many types and as much as he can, even if he has to start a fracas in order to convince the target they need weapons. On August 9, the Israeli military announced that a warplane of the Israeli Air Force (IAF) carried out an airstrike on a 5-story building in the area of Rimal in the northern part of the Gaza Strip. The Israeli military said that the airstrike was a response to a rocket attack on the city of Be’er Sheva, which is located more than 38km away from Gaza. While the Israeli military claimed that the building was used by Hamas’ security forces as a military base, Palestinian and Egyptian sources revealed that the building was an Egyptian cultural center. According to the Palestinian news agency Shehab, 18 civilians were injured as a result of the Israeli airstrike. Where's the night manager when you need him? According to Times of Israel the protesters numbered approximately 30,000 people. 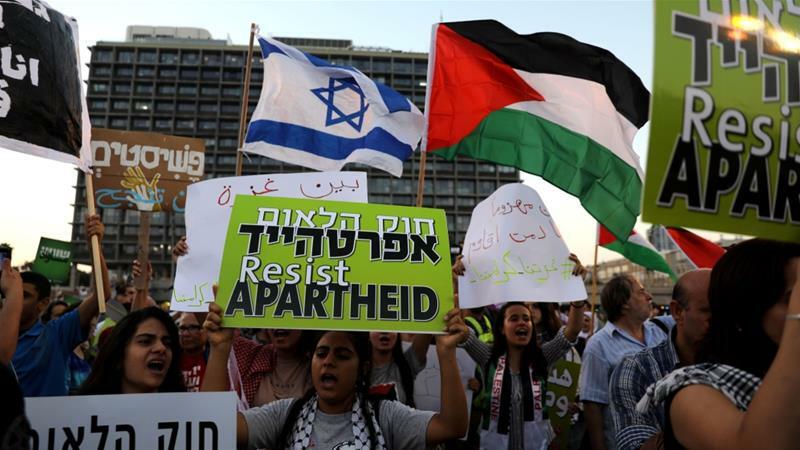 On Tel Aviv’s Rabin Square, the protesters chanted “resist apartheid” and “we are all brothers” against the controversial law which proclaimed Israel to be the nation-state of the Jewish people. The protesters waved banners demanding equality between the Jewish and the other nationalities and religions in Israel. The Palestinian citizens of Israel protested that the law will turn the non-Jewish in the country into second-class citizens. Aida Touma-Suleiman from the Joint List Party was cited by retarded. “We are here to call for equality, for full citizenship and equal rights on individual levels and on the rational level. We are here also to say “Netanyahu, you cannot decide to continue the occupation and to deny the rights of the Palestinians only by law”,” she said. Doubt you'll see this in the msm. Good to see so many from all backgrounds protesting the despicable Netanyahu and his fellow far right travellers. Criticism of the actions of the government of Israel is not anti-semitism. So people here seem to be confused about this. Does anyone have anything good to say about Israel?